Mother dragons raise their hatchlings until a certain point in their lives. After that point, the mother dragon scares the babies away, as can be seen on the Dragon Family Dagger. Those babies will be just fine, so do not worry! This ornate, wicked looking dagger depicts a large dragon looking fiercely at younger dragons. The larger dragon makes up the cast metal hilt of this dagger, with its tail being the handle and its wings, feet, and head making up the handguard. The blade of the dagger curves upwards toward the point, while the spine of the blade features a serrated edge, much like some Bowie knives. This stainless-steel blade has been etched with the image of a dragon breathing fire. The scabbard that this dagger comes with is curved and depicts a young, flying dragon and a serpentine dragon whose head forms the curved end of the scabbard. 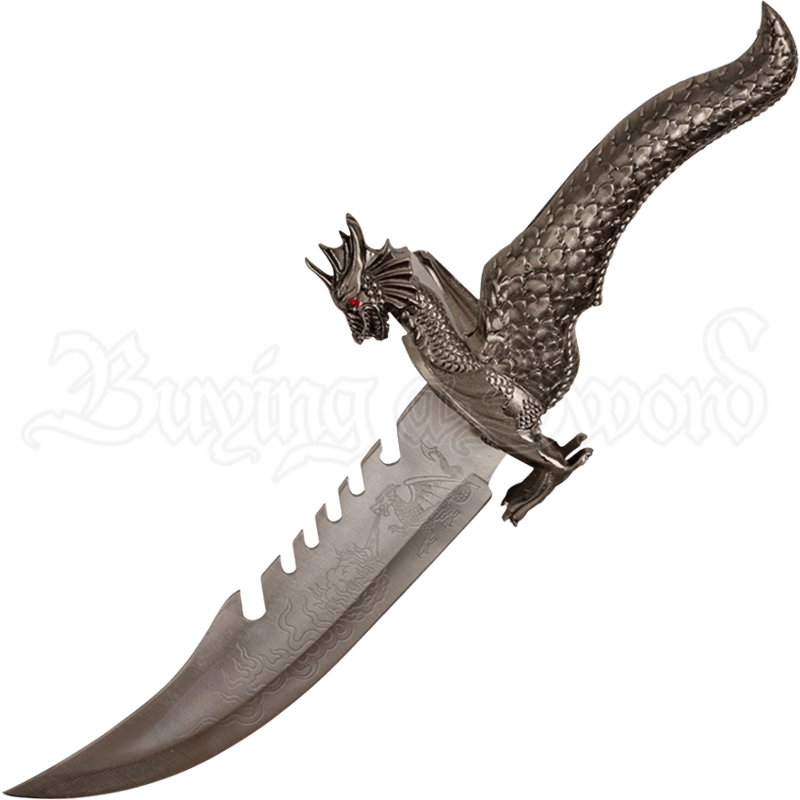 Perfect for everyday light use and as a home decoration, this ornate, functional, dagger makes a great gift for anyone who loves dragons and blades!